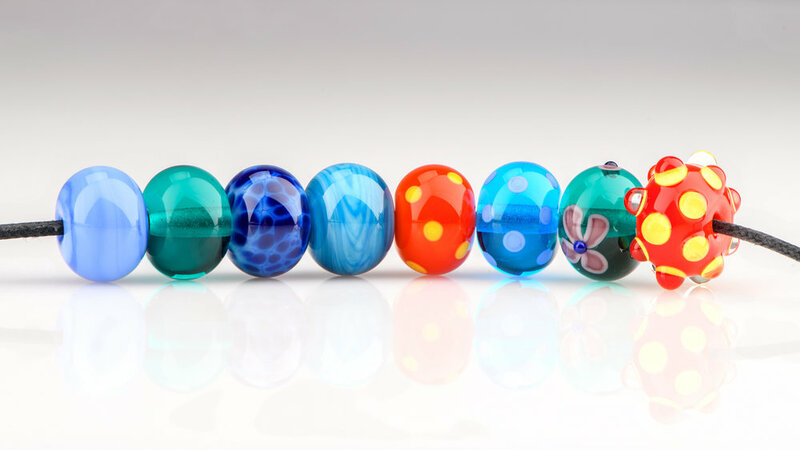 All-day lampwork glass beadmaking courses are priced at £125 per person. Starting from scratch, and encountering a progressive range of techniques, you will make around eight round beads in your session, with a hole size of 2.5mm. All materials are included. All-day courses start at 10am and finish at around 4pm. We take a break for a delicious homemade lunch, which is included. You will make around eight beads in your session: two plain ones, one decorated with frit, one with gravity-twisted frit, then moving on to random dots, 'regimented' dots, a stylised flower design and a raised dotted bead.